PanARMENIAN.Net - Canada’s Minister of Immigration, Refugees and Citizenship Ahmed Hussen has cited Syrian-Armenian refugee Shoushi Bakharian's achievments as a success story that came out from the country’s private refugee sponsorship program, Windzor Star reports. Hussen was addressing about 200 people at an event at the University of Windsor School of Creative Arts Concert Hall in the former Armouries. “Canada provided protection to her three years ago, she’s now studying aerospace engineering at Concordia University, she’s studying a fourth language and she’s already made an invention,” Hussen said. 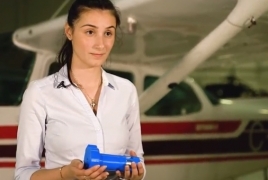 Bakarian has invented a renewable energy device called Ventus for small general aviation aircrafts in Canada. Earlier this year Shoushi discovered Stratos Aviation a non for profit association located in Dorval on Ryan Avenue which advocates careers and opportunities in aerospace to the next generation of aviation professionals through STEM education and pilot training. She quickly climbed the ranks and today at the young age of 21, she is one of the administrators of the association. Stratos Aviation is a multidisciplinary environment with a hands-on approach to educate and promote all aspects of aviation.